Les signes du temps appeared for the first time with the obscure watch in a booklet titled Des mystères du calendrier by Pr. Theophraste Pym (dated 1988 but it looks like other versions are dated 1990). There are 31 different signs listed into this booklet, each one associated with an image and a definition or a quote. The second publication of Les signes was found in a very rare magazine called Les Saisons, in issues numbers 1 & 2 (1991) where Schuiten and Peeters started the first draft of Le guide des cites. 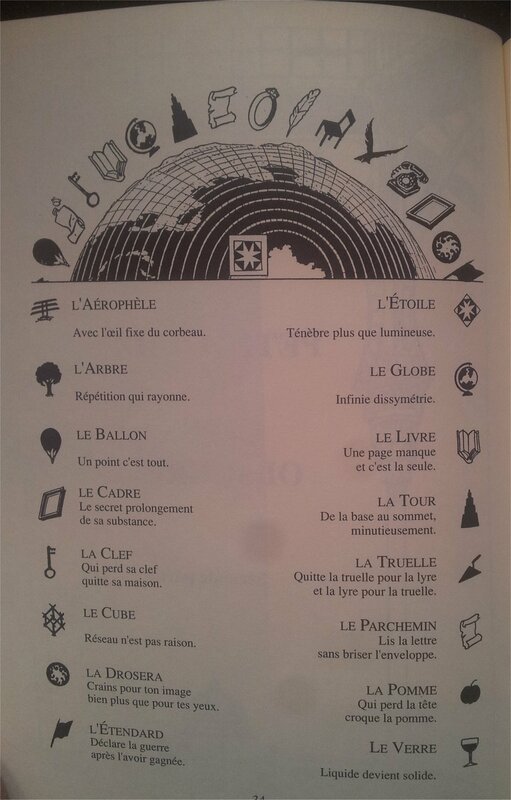 Les signes and their definitions were not all present like it was in the watch, only 16 signs were listed. There are also some differences. The signs were dispatched also into the texts of Les Saisons. The third and, and to date, the most complete list, was published into Le guide des cites in 1996 (in the chapter dedicated to Armilia). They are here 52 signs listed, once again with some differences. 28 La stupeur Immobile sur le pas de la porte ?! There are a couple of differences between the three appearances of these signs. First the amount of signs. 31 on the watch, 16 in Les Saisons and 52 in Le Guide des Cités. But even if the signs were mentioned on all lists, they are not always the same. Some images are different and also some quotes are different. You can download an extensive comparison: comparison signs du temps. The differences are marked in yellow.